CDs and DVDs are not used anymore because they are not eco-friendly and are not reliable in the long term. Moreover, burning hundreds of thousands of tiny files (smaller than 1ko) on a data DVD may fail (depending on burning drive, OS, directory depth,…). The only interest in optical backups is their price : 0,09 euro / Go. I then chose to turn to Iomega Rev removable disks, the most expensive solution (800 euros for drive + 5 disks). They have developed disks of 35 Go, 70 Go and 120 Go (a software included in the package allows compression to extend capacity). They have internal (sata, atapi, scsi) and external (usb 2.0) drives. REV technology is supposed to be faster than tape backups (for half the price) and more reliable than optical backups (which I confirm). But it stays the most expensive backup technology I have ever used : 2,29 euros / Go. “Pay the cost to be the boss” : Iomega announces a 30 years shelf-life for their disks. Your backup strategy can be improved using a NAS : a server with 1 to n bays that can hold 1 to n HDs. Connected to your network, it can be accessed from any OS part of your network. The idea is to choose a NAS with RAID so that you can improve the strategy some more. I use a two-bay Synology NAS configured with RAID 1 (I only have access to one of the 2 disks, the second one is used for mirroring, so, when I write something on disk 1, it is automatically written on disk 2). 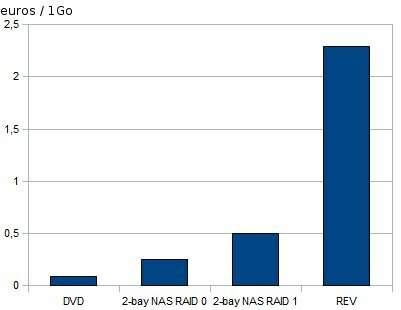 A 2-bay NAS with 1 To disks should costs 500 euros, which is 0,5 euro / 1 Go if you use RAID 1 or 0,25 euro / 1 Go when using RAID 0. The NAS is connected to your local network and you access it through the network with a user interface. It is delivered with a Linux OS and a firmware you regularly update online. In order not to copy a whole data disk to the NAS everytime I want to backup, I use a synchronizing software that first compares source disk data with destination (NAS) disk data. and synchronizes, updates the new or modified data. Syncback is a simple synchronizing tool software. You may also automate backups using Cron under Linux or Scheduled Task Manager under Windows.